Cook elbow noodles as directed on package, drain well, and return to saucepan. While keeping the stove on low heat, add the Velveeta cheese and milk and mix well. 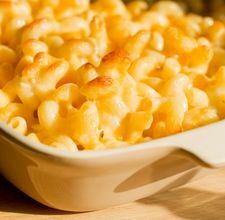 Once everything has been well mixed, you can either serve and enjoy OR transfer the macaroni and cheese mixture into an 8 x 8 baking dish, sprinkle the mixture with the bread crumbs and broil for 3-5 minutes, or until topping is just golden brown. Hubby Rating: 10! Mac and Cheese tastes so great, especially homemade! I hope you enjoy this delicious and tasty treat!